What do you say when someone tells you their father was sent to the Gulag? He came back from the war and off he was sent – Stalin’s orders, to the lager! Z.’s back was to me as she hunched over my bed, fixing the sheets, curling into even less space than her short body could claim. “He came back from the war, from the front, with children’s books in German, because I was studying German, you see?” A German book claimed a life where a war could not. Ghosts occupied every shadow of the apartment. Molotov-Ribbentrop. A siege. Young girls, starving but never quite dead. An unlikely reunion shattered. Two old women. And I, in their home. I will tell a fraction of their story, but I cannot take it. It is not mine. In 1918, Vladimir Ilyich Lenin and Anatoly Lunacharsky held a contest: what should represent their new regime? As the Bolsheviks consolidated power after the October 1917 Russian Revolution, they realized they needed a new seal, for symbols are powerful. The hammer and sickle won and in the summer of 1918, it was adopted by the Fifth Session of the Soviets and became the emblem of what would become the Union of Soviet Socialist Republics. 2018, Seattle. The Soviet Union is nearly 27 years dissolved and yet its symbol lingers: I find it on t-shirts, on flags at protests, as bathroom graffiti. I ask—and argue—about it and two themes emerge. Its bearers either are complimentary of the Soviet Union, or at least of Lenin, or they assert that the hammer and sickle is not a Soviet symbol, but a symbol of the broader working class. Left: Hammer and sickle graffiti in a Seattle bathroom. Right: Saint Petersburg House of the Soviets with Lenin and the Hammer and Sickle looking out onto the street. And then there are some truths. From the start, the Soviet Union was a police state. Lenin founded the secret police, the Cheka, whose name later was the KGB. It was under Lenin that the first forced labor camps were created; these were the foundation of the Gulag. Under Stalin, between six and nine million noncombatant Soviets died from deportation, preventable hunger, and work in concentration camps. Different ethnic groups were systemically, deliberately decimated. The entire Chechen and Ingush populations, half a million people, were deported to Central Asia as punishment for “collaboration.” During the Holodomor, four million Ukrainians, 13% of Ukraine’s population, starved to death as food was confiscated in a government campaign. Through the decades of the Soviet Union, Jews could not hold certain jobs or attend certain schools. And on it goes. Some people had good lives; others were crushed by the regime, or if not crushed, subdued. I know people in both groups. And I hold the suffering of the latter as important. Left: Lenin on a Seattle utility pole. Right: Lenin by Finland Train Station in Saint Petersburg after being bombed on April 1, 2009.
Who can claim a story? Each person can claim their own story, their own experience. Maybe they can even claim that of their family. Their lives are many little truths that coalescence into one larger grey and muddy truth, with its nuances and exceptions, its complexities and shortfalls. These larger truths are bound by history and stretch into the future. Symbols are an attempt to encapsulate a story, to represent that larger truth. So who can claim the hammer and sickle? Who can tell its story? I would posit those who have lived it. And so, in an admittedly non-scientific survey, I posed the following question, in Russian and English, to Russians and/or people who live in the former Soviet bloc: “What do you think the hammer and sickle represents? What does it mean to you?” The answers came in from friends and friends of friends, stretched across the world. Given my limited reach, relatively few people answered, but all who did have a story that interfaces with this symbol. 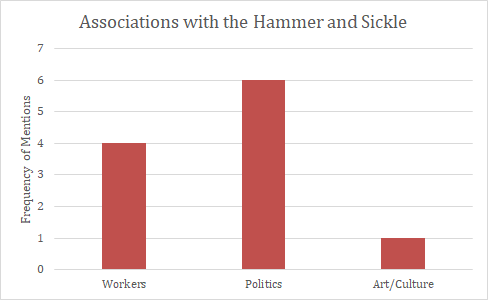 Feelings about the hammer and sickle ranged broadly, from horror to neutrality to slightly positive. The most common sentiment within this array was not a strong reaction to the symbol itself, but recognition of it as a symbol of a regime that, while it impacted people differently, was ultimately judged negatively by the respondents. Within these answers, people also associated the hammer and sickle with different things, or with many things: the Soviet Union as a political entity, art and culture, the working class. Though a justification of the symbol’s use in Seattle is that it represents, among respondents that association was less common than the Soviet government connection, even though my question did not mention the Soviet Union. These are reactions, feelings stemming from lives lived under the story of the hammer and sickle. This symbol flew above them, their families. Should those without this experience, then, claim representation through this symbol; should they say what it stands for? Or can we accept answers from those with experience, even when they vary, even when we have to hold many truths in one hand? Absorbing stories from people who were there has shaped my perspective. I’ll take it from them. Even if it’s not a uniform answer, it’s an experienced one, and each holds an individual truth. And I will hold the truths of those who really suffered above all, because this suffering cannot be negated. It’s Victory Day and, as usual, the television oversees our breakfast. The news is, of course, showing us images of the war and the Siege of Leningrad. “I can’t watch it, change it,” I. says. Z. switches to the culture channel. Same thing. The omnipresent television is turned off. After we eat, Z. and I. leave to participate in an event honoring veterans of the war and survivors of the blockade. That afternoon, I stood next to a sea of Soviet flags as the veterans’ parade flowed by. My Russian friends had flowers to give to veterans and so I brought them home. The elevation and the suffering collided that day. Left: Victory Day Parade in Saint Petersburg. Right: My blokadnitsi hosts, I. and Z. Symbols hold stories. Do not take these stories if they are have not been lived by you and yours; rather, take the time to understand. Listen and share – but do not claim what isn’t yours. Claim the stories you have experienced. Create your own symbols to encompass them and to imagine the future.